David Burke's Fishtail has been part of the NYC restaurant scene since 2008 and is still going, well, swimmingly. Downstairs is a large bar and a few tables; most dining takes place on the second floor accessible by stairs (although there is an elevator if needed.) The signature color of the upstairs is red, especially prominent on clusters of fish-themed artwork. It's bold, stylish and expensive although not stuffy or formal. If you want to drop in for Happy Hour, you'll sit downstairs at the bar nibbling goodies like the house burger, angry (lobster) tails with shrimp and chili, the crab cake sandwich or lobsters dumplings. 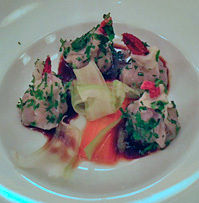 Both dumplings and the tails appear on the special Sunday evening three course, $45 "Lobster Louie" menu as well. One of the barrage of menus deals with cocktails with clever names, some old standards gussied up as was what was basically a vodka martini, the vodka crafted from wheat, the whole carrying three blue-cheese stuffed olives. Overall the food is very good; fish such as tuna, snapper and char can be had simply grilled with a choice of sauces or you can order a fancier fish dish like the cod with a tamarind glaze, turnip cake, peanuts, bok choy and other ingredients. "Angry" on the menu is Burke-speak for 'drizzled with chili oil," not always an entirely successful execution. Why you'd come to a fish-oriented eatery and not eat something from the sea beats me but in addition to the burger, a steak and fried chicken served with prawns are on the menu. The Sunday lobster menu offers three or four selections each for appetizer, entree and dessert. High marks to those dumplings although I don't see the point of inserting a lobster claw (the skinny kind usually sucked on at the end of a meal on a Maine beach) into each dumpling except to drive home the lobster point. The baked eggs add polenta and Italian sausage to the lobster while the surf and turf was a half lobster with four perfectly cooked slices of steak, a side of brocollini and potatoes mashed to the consistency of baby food (which I lapped up.) My dessert, a crunchy chocolate rectangle with a scoop of ice cream was incredibly rich; another diner was happy with his crème brulee in a small ramekin. The main drawback here is the service. Originally very professional, something has slipped which is pretty bad for such a pricey place. It took ages for anyone to turn up to take drink orders although the server was very pleasant once present. Seemed like a dearth of staff given the size of the place but perhaps we hit an off night. 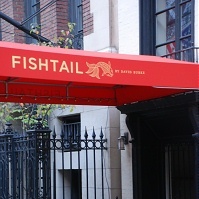 Fishtail is a good spot for a special occasion but, when you reserve, ask about service and maybe that will snap the staff into where they should be.